Welcome to the 2018-19 school year! I’m so excited to start my first year here at Hollymead. I believe in the power of students to embrace their learning through curiosity, and the power of teachers to inspire it. This is my 15th year in Albemarle County, and I have been a teacher, math specialist, Lead Instructional Coach, Assistant Principal, and Principal. I enjoy listening to all stakeholders, and figuring out how to help a school best support its students and community. The focus at Hollymead on meeting the academic, social, and emotional goals of children is something that has inspired me this summer. I’ve spoken with many parents, teachers, and some students, and it is extremely evident in those conversations, how much care is taken with the learning of students. The community is active in making the school a special place, and the teachers are dedicated to each student. These are admirable qualities in any school. This year, I’ll be spending a lot of time listening and learning from all of you about Hollymead and what makes it special. In addition, I’m interested in how we can engage students in learning that they are curious about while making sure that they are all growing skills that will help them in their future schooling and beyond. I’ll be asking students about their passions, what excites them about learning, and how we can make them more excited to be at school. I am planning to share some of those stories in this space throughout the year, as well as on the Hollymead twitter feed @HornetNews. Throughout the year, I hope that you’ll come to the school to see learning, to volunteer in a classroom, to attend a PTO event, or to just share your thoughts. 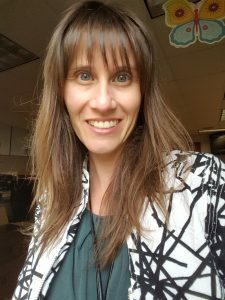 I know that this community has a lot of built-in expertise, and I’m hoping that some of you will come to see how you can share that expertise with our students. Hollymead is a great place to be, but I’m sure that by working together we can make it even better! Thank you for your commitment and your support of our students and our school. This entry was posted in Back To School, Uncategorized on August 7, 2018 by cdommer. Please welcome Sydney Wicks to Hollymead. She is part time at Hollymead, Mondays, Wednesdays and Fridays. She also works at Agnor Hurt. We are so happy to have her join the Hollymead team. Hi there! 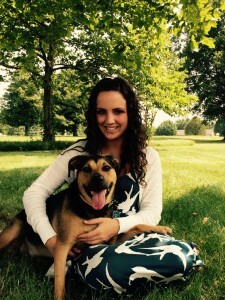 My name is Sydney Wicks, and I am joining the wonderful Hollymead community as a resource teacher. I was born and raised in Charlottesville, where I attended the University of Virginia for both my undergraduate and graduate degrees. I received my Master’s degree from the Curry School in both general elementary education and special education. 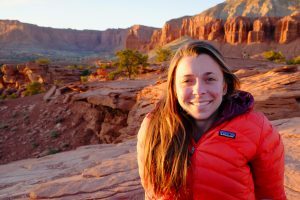 After graduating, I moved out to the great state of Wyoming where I spent two years teaching special education and enjoying the outdoors as a seasonal horsepacker and avid backpacker. I recently moved back to Charlottesville in order to be closer to family, and I am excited to be joining all of you! This entry was posted in Uncategorized on November 21, 2017 by nteel. It’s hard to believe that we’ve already finished the first quarter of the school year. During this successful start, there have been many exciting learning projects, field trips and school wide morning meetings. Our PTO has been so supportive of teachers already providing a coffee/muffin cart as a treat one day and snacks for a faculty meeting on another day. Several teacher grants have also been funded! The Spirit Week and Book Character Parade were lots of fun and helped build relationships at our school! CARES (cooperation, assertion, responsibility, empathy and self-control) is the cornerstone for how we treat each other at Hollymead. CARES is written on the walls. Students hear about CARES in classroom morning meetings and on the television broadcasts. They also hear about it when there is a problem and they determine which CARES word would help the situation. Please ask your child about CARES. Arriving at school on time is so important. Students who arrive late interrupt the flow of work and instruction in the classroom. Those students often feel like they are playing catch up, a feeling I know I don’t like. Make it a goal to get your child to school on time. On time is in the classroom at 7:55 a.m. We allow a 5-minute grace period, but begin writing tardy passes at 8:00 a.m. Some mornings we write as many as 35 tardy passes. Other mornings only a few. The best way for students to arrive on time to school is by riding the bus. The buses are all here before the 7:45 bell and they are all unloaded by 7:50. If your child is a walker, make sure they allow ample time to get to school. The crossing guards leave their posts at 7:55 am to be on time for other duties and will be unable to supervise children who are running late. The safety of our students is our highest priority and we want them to cross the street when a staff member is present and able to assist them. My door is always open. Please let me know if you have questions or concerns. I am truly thankful for all you do to support our students, our teachers and our school. Like you, I am saddened and horrified by the events and loss of life on August 12th in Charlottesville. My thoughts and prayers go out to the families and friends of the three people who lost their lives and to all the people who were injured. Charlottesville has always been my home, and no matter where I travel, I am always happy to return to my hometown. I love this university town and its diversity is part of its greatness. Some parents have concerns about what their children will learn regarding these events at school. We discussed this very thing the first day teachers were all together on Monday, August 14. We reminded teachers that as school representatives we are politically neutral. At the same time, we will always educate students through Hollymead CARES and reinforce the importance of being a welcoming community. Our school should be a place of safety for all students. We anticipate that some of our children will come on Wednesday knowing all about these events and others will come knowing nothing about it. This is a parental decision and it is important for us to support your decision. As I wrote above, we will not start any conversations about the recent events. It is important to know that some students might start conversations. If this happens, teachers will redirect them so that they can continue the conversation with an adult in private. Megan Kopley, our school counselor, and Lauren Servis, our school psychologist, will be available to talk as necessary. Staci England, our assistant principal, and I will also be very visible and available for children as needed. This entry was posted in Uncategorized on August 22, 2017 by nteel. The excitement is building. For a couple of weeks teachers have been in and out of the building planning and organizing classrooms in order to make sure we are ready for a great start to the school Year. It is a most wonderful time of year when we are all excited to learn and grow with our new classes! We have a couple of changes in staff at Hollymead this year. As you may already know, Megan Kopley will be our new guidance counselor. She has many years of experience as a counselor and a classroom teacher. She is excited to get to know students, families and staff. The lower numbers in grades kindergarten and first grade are moving up and there will only be three classroom teachers in second grade this year. Mr. Bernhardt is moving to 4th grade and Ms. Groeber-Fard is going to 5th grade. All students at Hollymead will be using a new math program this year called ST Math. The “ST” stands for spatial temporal because they have to manipulate images in their mind in order to solve math problems. ST Math has been used in Albemarle County Title I schools for the last five years and has helped them be successful. In fact, the research shows that students who are using ST Math grow significantly in their mathematical achievement. This web-based program begins teaching concepts non-linguistically and then connects to symbols and language. This is a standards-aligned program that allows students to move forward as they master each level. Teachers have control over what students are working on and monitor student progress so that they can help when students are stuck. Each grade level will decide how ST Math will fit into their math classrooms. ST Math can be used whole class and/or in a center rotation. ST Math is designed to be challenging and will help us continue with our emphasis on “failing up”. We try to help everyone understand that you have to be willing to fail sometimes in order to learn. We will continue our work on Project Based Learning. Our goal is to give students more opportunities to use creativity and critical thinking to learn and demonstrate their learning. Some PBL will give students more control and choices over what they are learning. Teachers will be developing opportunities for students while also sharing and receiving feedback on the PBL offered from colleagues. As you know, we work to emphasize Hollymead CARES in all the work that we do. CARES stands for cooperation, assertion, responsibility, empathy, and self-control. We know that you are also teaching these things at home and together we will help our community be a place we can be proud of. Please contact me if for any questions or concerns. You can reach me by phone, 434 973-8301; by email at nteel@k12albemarle.org; or in person at school. 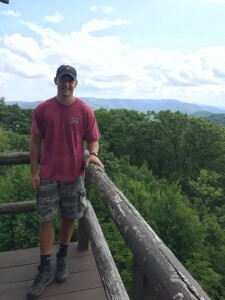 This entry was posted in Back To School and tagged 2017, 2017-18, 2018, ACPS, Albemarle County, Back to School, Charlottesville, Elementary, Hollymead, Nancy Teel, New School Year, Project Based Learning, School, ST Math, Virginia on August 16, 2017 by nteel. I am excited to have the opportunity to be the School Counselor at Hollymead Elementary. I come to Hollymead with 17 yrs of experience in education. After completing my undergraduate degree in my home state of New York, I set out on an adventure moving to Virginia. I started my career as a teacher in Stafford, VA in 2000. In 2004, I completed my Master’s of Education in Counselor Education from VCU. I have been working as a School Counselor in Spotsylvania, VA since 2004. I am grateful for the opportunity to work with the Hollymead community this coming school year. I am a mother to a 7 yr old daughter, Hayden. Together we love hiking, camping, paddle boarding and any adventure that takes us outdoors. I am a certified Kidding Around Yoga Teacher for kids and love sharing yoga with others. We often come to Charlottesville to walk the downtown mall or attend festivals and events. I am excited to move here and experience all this area has to offer! This entry was posted in Uncategorized on July 13, 2017 by nteel. We have added a musical piece of equipment to the fenced in playground. There is a keyboard and drums for our musical visitors. The funds were raised during the Fun Run Fundraiser on Septem ber 12, 2015 and other sources of fundraising including the Hollymead PTO and grants. 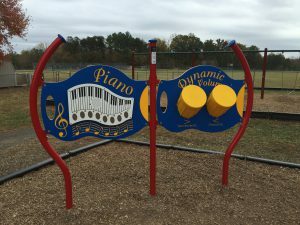 The new piece of equipment along with the sign dedicating the playground to Robin Aldridge are in memory of Robin Aldridge, an early childhood special education teacher in Albemarle County for many years. We tragically lost Robin and her daughter Mani on Friday, December 5, 2014. 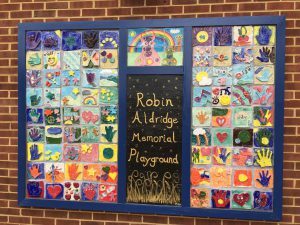 Robin had been teaching the pre-school class at Holllymead for two and a half years . 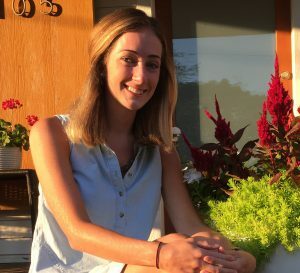 She was a strong advocate for all students, but especially for students with special needs. She loved children and music and we celebrate her life on a fun filled playground with music. I want to thank the Robin Aldridge Memorial Committee, everyone who participated in the Fun Run and others who donated their time and money to raising this memorial to honor Robin. This entry was posted in Uncategorized on November 30, 2016 by nteel. I am excited to announce the new guidance counselor for Hollymead. She will start working officially today, August 29 and will be in classrooms beginning tomorrow! Her picture and bio are below. I hope many of you can meet her on September 7 at Back to School Night. My name is Ashley Gareau and I am the new school counselor at Hollymead Elementary. I recently moved to Charlottesville from Worcester, Massachusetts and I’m thrilled to be joining the Hollymead team! Prior to being at Hollymead, I worked as a school counselor in an elementary special education program in Massachusetts. I completed my Master’s in Counseli ng Psychology at the Massachusetts School of Professional Psychology in Newton, MA and my Bachelor of Arts in Psychology at Lafayette College in Easton, PA. In my spare time, I enjoy hiking, gardening, reading, and spending time with my dog outside. I’m very excited to be at Hollymead and I’m looking forward to a great school year! This entry was posted in Uncategorized on August 29, 2016 by nteel. This summer has been a time of change at Hollymead. Most of these changes were unexpected, but we try to embrace them as opportunities for growth. We will miss the teachers leaving as they have been colleagues, but also friends. Kindergarten: There will be 3 teachers instead of 4. Glenn Bernhardt has moved to 2nd grade. Beth Kohler, Susan Peck and Joanne Kohlmann will continue to teach kindergarten. First Grade: There will also be 3 teachers. 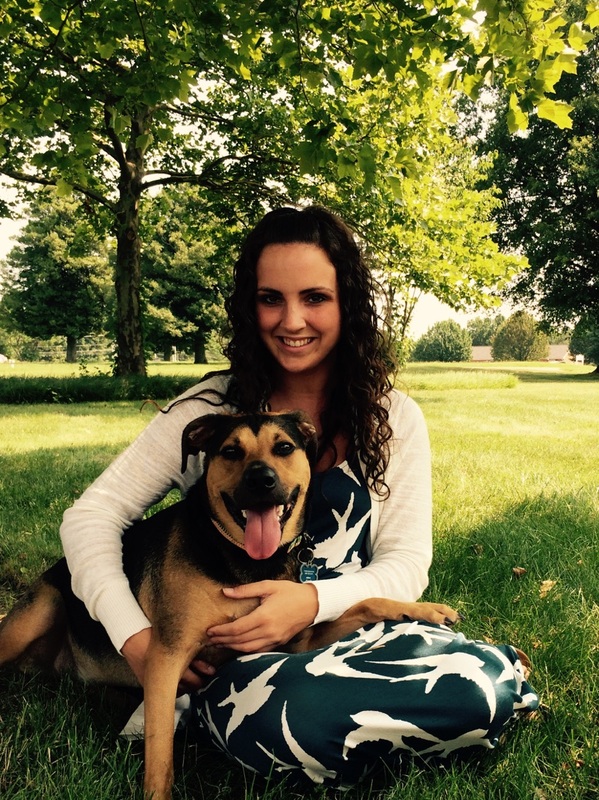 Ms. Throckmorton will be teaching at Stony Point Elementary this fall. Julie Lindenbaum, Whitney Hinnant and Maria Ellis will continue to teach 1st grade. Second Grade: Glenn Bernhardt joins the team, while Cindy Groeber-Fard moves to 4th grade. The other 2nd grade teachers are Leslie Anderson, Lauren Santana and Hollyday Marks. Third Grade: Kristin Kress has moved to Autism BASE teacher. Pam Snead has been hired to join Cindy Hersman, Sarah LaPrade and Claire Neill on the 3rd grade team. Ms. Snead has 16 years of teaching experience, most of it in third grade. Fourth Grade: As many of you know, Jeff Matriccino moved to 6th grade at Sutherland. Cindy Groeber-Fard joins Becky Brown, Terry Gallagher and Sarah Parsley on the 4th grade team. Fifth Grade: Gabe Gomez, a new teacher from UVA , joins Jonathan Whitehead, Anna Snyder and Kim Blevins on the 5th grade team. PE: Luke Noble helped out part time in PE last year, but as enrollment changed we no longer qualified for the extra position. Mr. Noble is teaching PE full time at Stone Robinson this fall. Barb Rosen and Jack Carroll will continue to be our PE team. Special Education: Keary Pieczynski and her family have moved out of the area, and as noted earlier, Kristin Kress is taking over the Autism BASE classroom. Intervention: Elizabeth Player has moved from a 1st teaching assistant to a part time intervention position. 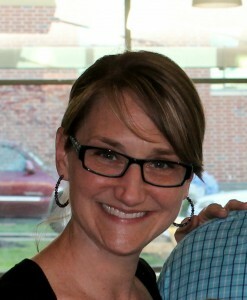 Rebekah Saunders, who was the intervention teacher last year, will be teaching at Greer Elementary School this fall. Guidance: Warren Meehan has moved out of the Albemarle County area. This is a very recent development and we are still in the process of hiring a replacement. We also have many new teaching assistants in kindergarten, 1st grade and in special education. Dismissal time is also changing this year. Dismissal is at 2:30, five minutes later than last year. At 2:30 students going to EDEP, to the car pick up line, to ACAC bus, and kindergarten through 2nd grader bus riders will be dismissed . At 2:35 , 3rd-5th grade bus rider will be dismissed. At about 2:40 walkers and bikers will be dismissed. School begins at 7:55. That is the time we expect all students to be in their classrooms. In the past few years we’ve seen a trend of students getting to school later and later. Staff on morning duty are at their posts at 7:40 and children are sent to classrooms at 7:45. When students come late, instruction and classroom routines are interrupted. Children who are late often feel the pressure of catching up with others. 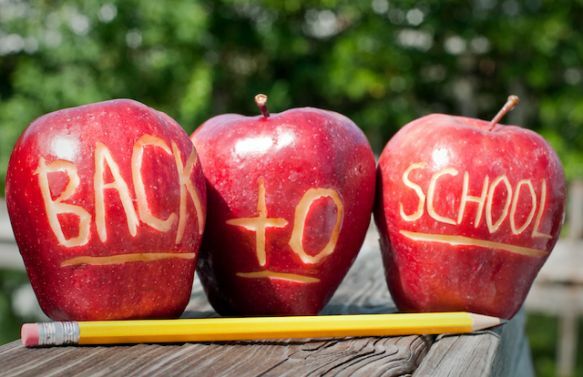 We are just days away from the exciting first day of school. Class placements are scheduled for the Parent Portal on August 19. Kindergarten Orientation is August 17 and Open House is August 22nd. I am looking forward to a wonderful school year. My door is always open. You can always reach me in person, by phone or by email. My name is Gabriel Gomez and I will be teaching 5th grade at Hollymead Elementary for the 2016-2017 school year. I was born and raised in the state of Colorado, Go Broncos! I moved to Virginia in order to attend the University of Virginia. I competed as a division one athlete and was a part of t he 2010 ACC Wrestling Championship team. I received my bachelors in government and recently received my masters in elementary education. My student teaching took place in third grade, but I am excited to be moving up grades having substituted multiple times for 5th grade. I enjoy running, reading, and playing/watching sports such as disc golf, baseball/softball, basketball, hockey, and football. As an educator I am excited to grow and learn with my students! 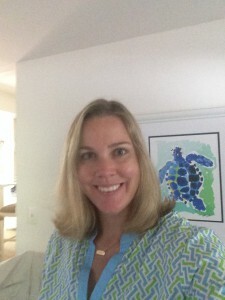 My name is Pam Snead, and I will be teaching third grade at Hollymead this year. While I am new to Hollymead, I am not new to teaching. I taught in my hometown of Madison, VA for 16 years (most of which was in a third grade classroom) before taking this past year off to be home with my daughter, Sophie. When I am not teaching, I love spending time with my family, volunteering at church and curling up with a good book in one hand and a Starbucks or Greenberry’s coffee in the other. After being out of the classroom for a bit, I feel a renewed excitement about teaching, and I am thrilled to be a member of the third grade team at Hollymead Elementary for the 2016-2017 school year! This entry was posted in Uncategorized on August 19, 2016 by nteel. 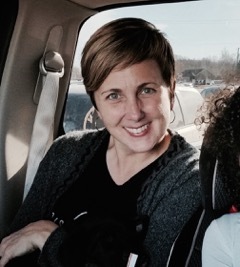 My name is Cindy Hersman and I will be teaching third grade at Hollymead Elementary for the 2015-2016 school year. I began working at Hollymead last year as a long-term substitute in special education and again in first grade. Previously, I worked for nine years in Howard County, Maryland, where I taught second grade, third grade, and special education. When I’m not working, I enjoy walking my dogs with my husband, Andy, and two children, Bella and Ben. 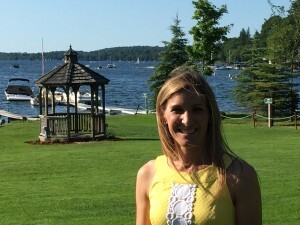 I am so excited to resume my teaching career right here in my own neighborhood, Hollymead! I am Lisa King. I have been teaching for 18 years, in New York, New Jersey, and Virginia. I am originally from New York, but after living in Charlottesville and teaching at Hollymead for eleven years I consider Charlottesville home. When I am not teaching I love watching my children participate in sports, running, and surrounding myself with family and friends. I have a new role at Hollymead this year as the Gifted Resource Teacher. I believe in an eclectic philosophy drawing from many different educators, to create a learning environment that supports life long learners. Equal weight needs to be given to high expectations for teachers and students, providing a non-threatening environment to enhance the students’ excitement of authentic learning and allow a feeling of safety and structure. I am confident, in a nurturing environment all children will excel and succeed. My name is Emily Throckmorton and I recently graduated from James Madison University with my Master of Arts in Teaching. I also completed my undergraduate career at JMU, making me a Double Duke! I grew up in Louisa County, VA and I love to go home and visit with my wonderful parents and twin brothers. After completing my student teaching in first grade, I was ecstatic to find out I would be teaching first grade here at Hollymead Elementary! I love all of the learning, exploring and fun we get to have! In my free time I enjoy teaching dance to all ages, playing the piano, spending time at the beach, reading, and playing with my dog, Bentley. I’m looking forward to a wonderful year! My name is Hollyday Marks. I was born and raised outside of Washington, DC in Potomac, MD. I graduated from The Potomac School in McLean, VA in 1997 and from Gettysburg College in 2001 with my Bachelor’s in health and exercise science and minor in Spanish. I worked for Club Med for 3 years and lived in the Bahamas and Indonesia as a fitness instructor and ultimately managed the sports team. I earned my master’s degree from University of Phoenix in 2006 in special education and taught for 3 years in Stuart, FL. We moved to Charlottesville in 2013. Last year I did long term substitute positions at Baker Butler, Red Hill and Stone Robinson. I am excited to be teaching second grade at Hollymead this year. I am a proud wife and mother of 2 sons, Landon (4) and Brody (nearly 2 months!) We are an active family and love living here. I love to read (when I find time! ), workout and in general enjoy Charlottesville, my family and friends! My name is Luke Noble. I was born and raised in Charlottesville, Virginia, attending Albemarle County Schools Greer, Jack Jouett, and Albemarle High School. I went on to attend the University of Virginia and graduate with my Masters in Health and PE in 2014. 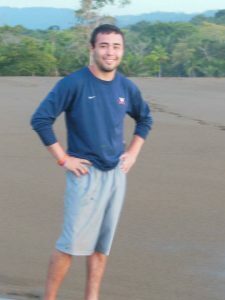 I ran track and cross country throughout high school and continued collegiately at UVA. I continue to enjoy running as well as many other outdoor activities such as hiking, camping, and swimming, playing organized recreational sports, and working out. I love watching any UVA athletics as well as professional football and basketball. This year I’ll be part time at both Woodbrook Elementary School and Hollymead. This entry was posted in Uncategorized on August 6, 2015 by nteel.